YAOUNDE, Sep 5 2013 (IPS) - When Francois Biloa fell ill with malaria, his family did what they had always done in the past – they gave him anti-malaria drugs and antibiotics bought from the local market. Only when his condition worsened and he became bedridden and fell unconscious, did his family take him to a local clinic in Cameroon’s capital Yaoundé. 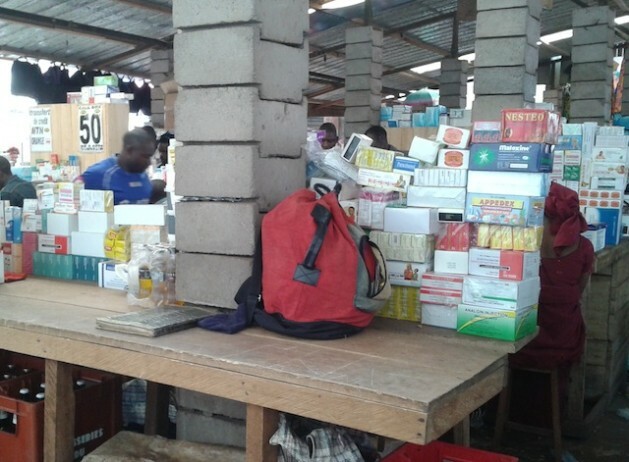 According to the clinic’s health attendant, six out of every 10 patients there had been using illegal or counterfeit drugs readily available in this Central African nation’s market place prior to admittance. “We bought medicine from a store because it worked for us with [previous] malaria attacks and it is very affordable. With just about two dollars we usually afford a [fake] Coartem packet, which is a full treatment for malaria,” Biloa tells IPS from his hospital bed. In pharmacies, a packet of Coartem costs seven to eight dollars, while on the illicit market a packet can be bought for less than three dollars. A medical consultation costs four dollars on average. “But in this hospital, I am told my bill is now over 75 dollars. The doctor says that I have a resistant strain of malaria and also typhoid fever,” Biloa says. In markets and on roadsides across Yaoundé, fake and illegal drugs are stacked on wooden racks and tables, openly displayed for sale. Trading in these drugs is illegal. The are available as a result of weak regulation, poor health services and high medical costs. There are no precise figures on the quantity of illegal drugs entering Cameroon, but up to 70 percent of drugs sold here are traded on the black market, says Christophe Ampoam of the National Council of the Pharmaceutical Society of Cameroon. According to Ampoam, this trade in illicit medication is so well organised that government officials and the police are helpless to halt it. “The trade in illicit drugs in Cameroon operates like a very powerful mafia-like network, which is very difficult to dismantle. It is estimated that investment in illicit sales of medicines is five times more lucrative than through the regular system. Local officials dread dismantling the network because it has also infiltrated the judicial and customs system,” Ampoam tells IPS. Ampoam says that most of the counterfeit drugs are made in the Middle East and East and South Asia, yet many carry the inscription ‘Made in Germany’. They are smuggled into Cameroon by sea and through the porous borders this country shares with Nigeria and the Central African Republic. “Although it is difficult to give an exact statistic on the percentage of illicit drugs found in local markets today, the availability of drugs in local markets, makeshift shops, on the streets and along the highways tells of the deplorable situation in Cameroon,” he says. The World Health Organisation (WHO) estimates that worldwide 200,000 deaths per annum could be prevented if people did not use counterfeit drugs. According to the International Policy Network report, fake tuberculosis and malaria drugs alone are estimated to kill 700,000 people globally each year. “Most of the drugs in circulation have been banned in certain countries because they are toxic or counterfeit. Some have the correct ingredients but in low quantities. Some of the drugs are samples or medicines donated by NGOs,” Ampoam explains. Marlise Loudang, director of the pharmaceutical inspection service at the ministry of public health says that government teams in every region across the country are clamping down on the illegal trade, but so far efforts have been unsuccessful. “Self-medication [with illegal and counterfeit drugs] is a big public health problem in Cameroon that affects almost every family. This stems from the easy access to drugs of doubtful origin and quality all over the national territory,” Loudang tells IPS. Olinga says he makes about 40 dollars a day. “We receive many customers daily. Some come with prescriptions from doctors others seek our advice before buying and some simply demand what they want,” he tells IPS. According the WHO, there are 13,514 patients for every doctor in Cameroon, although some say the ratio is higher, especially in rural areas. Poverty also limits many from seeking medication from hospitals and health clinics. “Some patients run from costs of consultation in hospitals and fall in the hands of illegal drug vendors who are ready to sell drugs at prices far more below the legal market price,” Williams Takang from the Yaoundé University Teaching Hospital tells IPS. “Self-medication [with illegal and counterfeit drugs] results in common health problems in local hospitals and the worst of these cases are in hospitals found in poor neighbourhoods and rural communities where the poverty level is very high and access to a doctor is costly,” he says. “The intake of fake and illegal medicines can lead to life-threatening consequences especially for diseases with high mortality rates like malaria. Unfortunately most of the patients suffering from these common diseases put themselves on medication without any prior medical consultations,” Takang says.